Hewlett Packard Enterprise will collaborate with Sandia National Laboratories and the US Department of Energy to build the world’s largest Arm-based supercomputer. Based on the HPE Apollo 70 system, ‘Astra’ will feature 2,592 dual-processor servers with 145,000 Cavium ThunderX2 cores and deliver 2.322 theoretical peak petaflops of performance. The nodes will consume 1.2MW of power, cooled by HPE’s MCS-300 Cooling Units. Astra will be installed at Sandia, in an expanded part of the building that originally housed the Red Storm supercomputer, an innovative system that we profiled earlier this year. The Arm-based supercomputer will be used by the National Nuclear Security Administration (NNSA) to run advanced modeling and simulation workloads. “One of the important questions Astra will help us answer is how well does the peak performance of this architecture translate into real performance for our mission applications,” Mark Anderson, program director for NNSA’s Advanced Simulation and Computing program, said. Scott Collis, director of Sandia’s Center for Computing Research, added: “Emerging architectures come with many challenges. Researchers anticipate that they will continue to improve and upgrade the hardware. 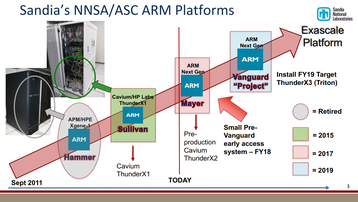 The supercomputer is part of the NNSA’s Vanguard project, a multi-system initiative to build various Arm computers, with the aim of creating and funding the necessary tools and technologies “to enable a credible Arm-based Advanced Technology System offering for ASC post 2022,” a 2017 presentation noted. Arm is also being used in Catalyst UK, a 12,000-core machine that will be distributed across clusters located at the University of Edinburgh, the University of Bristol, and the University of Leicester. But the biggest deployment will arrive as part of Japan’s Post-K supercomputer, a 1,000-petaflop next generation system engineered by Fujitsu. It is currently set to launch in 2021-2022.